Carnival Liberty is one of Carnival Cruise Line’s mid-sized ships, coming in at 110,000-gross registered tons, and some say it’s a perfect size. 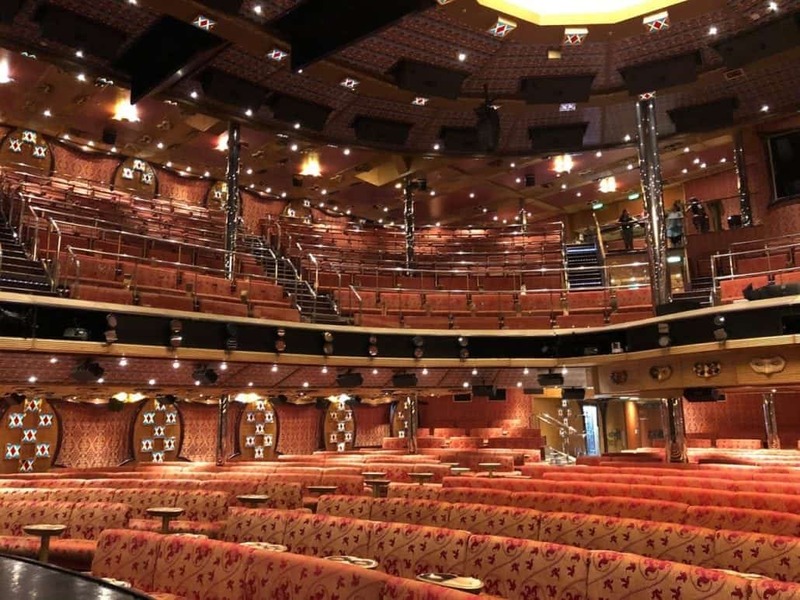 The ship features venues that some of the newer ships gave up in favor of more cabins. As of 2019, Carnival Liberty currently sails from Port Canaveral, Florida (40-minutes from the Orlando International Airport). The ship was the first vessel to undergo Carnival’s Fun Ship 2.0 initiative back in 2011. If you’re a first-timer, here are some things you don’t want to miss on this cruise ship. 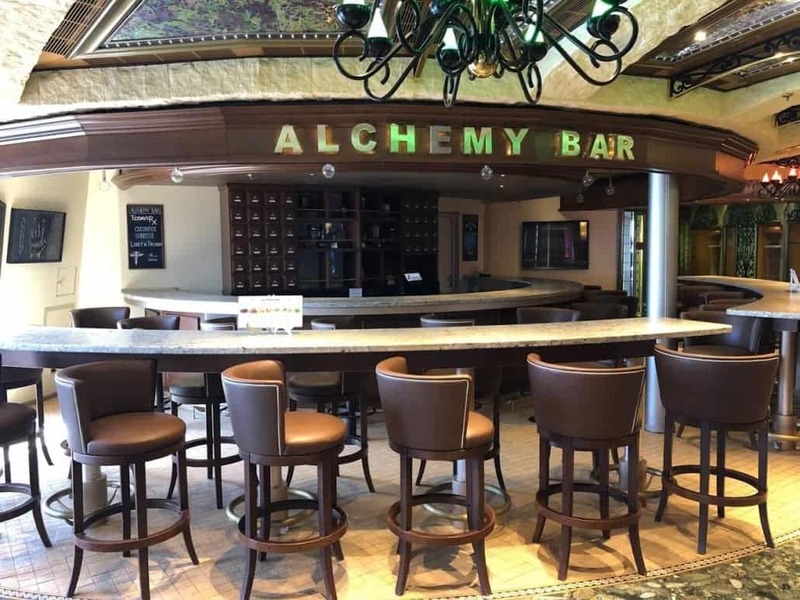 The Alchemy Bar is more of a night time location. The Alchemy bartenders are the best on board! And they don’t just make any good drink – they’ll make a custom drink just for you that incorporates your alcohol, drink, and/or flavor preference. I’ve previously told them I like Manhattans and chocolate, and also martinis and chocolate (martinis were $1 off that day). Flavors you can ask for are chocolate(of course), cinnamon, lemon, orange, apple, rosemary, cucumber, and mint. I’m sure you could combine a couple if you’re feeling adventurous. Every drink at Alchemy is $10.95 but check their chalkboard for which drinks gets $1 off that day. Alchemy does have a menu with excellent drinks, but it’s definitely more fun to get something just for you. And if you buy the CHEERS! drink package, you won’t have to worry about the prices on the board and you can stay hydrated with the bottled water. The Seafood Shack on Carnival Liberty. They’ll set you back $12, but you won’t regret spending money on this treat that you can enjoy poolside. If you don’t like lobster, there other menu selections that any seafood lover will enjoy such as buckets of fried clams and shrimp, clam chowder, and fish and chips. Ask anyone who has had it, they will be sure to recommend the lobster roll. Dive In Movie screen on Carnival Liberty. Most of Carnival’s fleet have Dive-in movies now, but Carnival Liberty has an amazing set up for viewing. On some ships, the majority of the seating requires craning your neck. Not on the Liberty however. Here, you’ll find loungers on numerous levels of stadium “seating” spanning multiple decks. The movies selected are not new releases, but they’re only a few months old and free! You will also want to stop by the Red Frog Rum Bar (this ship does not have a Red Frog Pub) after snagging your seats for some free popcorn to munch on. If it gets chilly out, head to the towel hut and check-out a blanket or two (they’ll record your cabin number and charge you for the blanket if you accidentally keep it). On the other hand, if you are feeling warm, you can head to the ice cream machine, also located on Lido deck. Mongolian wok aboard Carnival Liberty. Mongolian Wok is only open from 12-2:30 p.m., so it’s easy to miss – but make sure you don’t! Because of the limited hours, you might have to wait in a 30-minute line, but don’t let the slow-moving line deter you. As you get closer to the front, you’ll get a bowl and beging making a completely custom meal. You pick your noodles: lo mein, cellophane, rice noodles, or mix and match. You can choose from around 15 vegetables to add to your bowl. When you get to the front, you’ll pick a protein: chicken, pork, calamari (sorry, no tofu) and a sauce: Szechuan, Thai BBQ, Black Bean, and soy sauce (not listed, but an option). Mongolian Wok station on Carnival Liberty. Pro Tip: the Szechuan sauce is pretty spicy. Some of the newer Carnival ships have Guy’s Pig and Anchor Smokehouse, which is an outside BBQ joint located on an outside deck. Liberty has Ole Fashioned BBQ, this is basically a non-branded version of Guy’s Smokehouse. You have an option of chicken, beef and pulled pork. Along with sides like coleslaw, potato salad, mac and cheese and baked beans. This is a place you should plan on going on the first day of the cruise because as the cruise gets going, so does the crowd. Aft pool and hot tub on Carnival Liberty. Carnival has been moving away from having adult-only pools. If you’re on Carnival Liberty, make sure you head to the back of the ship if you want to avoid getting splashed. Pro Tip: At night, they close the roof so that you can enjoy the pool without chilly wind ruining it when you get out. The party starts in the main atrium on Carnival Liberty. This is the best event on board for those who aren’t afraid to get up and move. If you’re a bit shy, don’t worry, there will be a ton of others right up there with you! Make sure to be down on the dance floor of the lobby if you want Mardi Gras beads, they can only throw them so far. The event starts with selecting a Mardi Gras king and queen, for which the candidates are randomly selected by the cruise director who is hosting the event. The candidates will have a dance-off to determine the winner, so if you want to win you really need to bring it! The event continues with a conga line around the lobby and then a night of dancing. If you have little ones, you can sign the kids up for the Night Owls (babysitting with an added fee) program at Camp Carnival. Chances are if you have teens, they’ll already by busy in Club O2. Sushi at Sea on Carnival Liberty. The Liberty has a “Sushi at Sea” on the lido deck, which is reasonably priced and pretty enjoyable. There is a small menu of some staple sushi items including 4 different rolls, sashimi and nigiri. You’ll wait in line at the window to place your order. Don’t be deceived if there is little to no line. After you place your order, you’ll be given a buzzer, so you really have no idea how many people’s orders are ahead of yours. Go a little earlier than you’d like to eat to make sure that waiting for it won’t cause you miss a comedy show, or sunset on your balcony. The Sushi at Sea menu. If you have a balcony, I recommend you take your sushi with you and enjoy it seaside and at sunset – depending on which way the ship is going. If not, don’t waste the fresh air by eating it inside, walk a little way forward or aft and find an outside table. Sushi-at Sea is open from 12-10 pm on embarkation and sea days, and from 5-10 pm on port days. Cereal crusted French Toast is on the sea day brunch menu, for now. The options are a little more limited than the breakfast menu, but you don’t have to get up early, and there are some extra items including steak & eggs, a delicious tomato soup and caramel cheesecake. There are some other unique items, but those are my favorites. On the Liberty’s three and four-day sailings, you’re only going to get one chance to try it out, so make a point to head to the dining room that day instead of the Lido buffet or the Blue Iguana Cantina. The water slide on Carnival Liberty is located on deck 14. The Liberty only has one water slide, but it’s a really good one. If there’s a line, it’s worth waiting for at least once. Without a line, you’ll want to go a few times! This probably varies by cruise and even day-to-day, but the water wasn’t cold which made it easy to enjoy. 11. Get pizza delivered – anywhere on the ship! Get pizza delivered anywhere on the ship! It will cost you $5 per pizza (tip annoyingly not included), but you don’t have to wait in line or lose the deck chair you finally acquired! To order pizza to your cabin, a bar, or a deck chair, open up your Carnival Hub app and find it in the side menu. The pizza doesn’t come from the kitchen on the Liberty, it comes from Pizza Pirate. If you’re ordering poolside, make sure to take a selfie when ordering (you’ll have the option) so that the delivery person will recognize you. If you’re looking to spend some time in the sun, go up to the top deck. There is a nice breeze on deck 14 by the entrance to the kid’s slide. Most of the cruisers flock to the lido deck pools or serenity during the sea days so chances are you’ll have your choice of real estate up there. Blue Iguana Cantina on Carnival Liberty. The Blue Iguana Cantina not only serves tacos and burritos during lunch, but also a killer breakfast burrito in the morning. You can pile it high with breakfast meats, eggs, cheese, and veggies. This is perfect for a grab-and-go type lunch. Victoria aft lounge on Carnival Liberty is where the Punchliner Comedy Club is held nightly. The Punchliner Comedy Club is located on deck 5 aft and has a large variety of seating. A good piece of advice is to get in the club early because they have really cool round couches that you and your party can grab and enjoy the show. They are a lot more comfortable than just sitting in a regular chair. The comedy club manager usually opens the door 20-minutes prior to show time. The track is located on deck 11 behind the dive in movie screen. The jogging track is located on deck 11 aft and can get pretty crowded, especially with the walkers. If you’re looking to get your exercise on during the sailing, consider going to the track early. Between 7:30 and 9:00 seem to be the prime time for the walking crowd. Or you can head up to the gym. The gym also gets crowded, so you’ll want to get there early as well. Both the gym and jogging track will have a nice ocean view. Carnival Cruise Line breakfast room service. There are some room service items that cost money and some that are complimentary. However, after 10 p.m., all of the items you order will have an after-hours service charge. So make sure you know what time it is when you’re ordering. A good alternative to room service is popping by the 24-hour complimentary pizza joint or seeing if they have the Late Night Selections in the Lido buffet area. For example, their Totally Awesome Wings or Chicken Strips are $5 on the late night menu. Guy’s Burger Joint on Carnival Liberty. Make sure you get one of those famous hamburgers at Guy’s Burger Joint. This is a complimentary venue that you can eat as much as you’d like. There is a menu of five different burgers, but if you want to customize your own, all you need to do is head over to the toppings bar where you’ll find a selection of grilled onions, mushrooms, bacon, lettuce, tomato, onions, and about a dozen different types of sauces. The shore excursion raffle is usually held in the main theater. Even if you don’t plan on buying a spa treatment or a bottle of booze, you should consider going to the drawings anyway. They normally offer free spa treatments or steakhouse dinners if your name gets picked in the raffle. There’s no obligation to enter either. So if you have the time, drop in and put your name in the hat. The Atlantis resort in Nassau, Bahamas. Shore excursions are a big money maker for the cruise lines and sometimes they’ll use scare tactics to try to get you to purchase their tour and not an outside vendor. Although you should be smart and know what time your cruise ship leaves, you are free to book an outside tour if you’d like. A lot of the popular tours in Nassau are the all-inclusive beach resorts or the Atlantis water park (which can be very expensive!). Since this is an older ship, there aren’t many options when it comes to plugging in your devices and the ship does not have any USB ports in the staterooms. There is one electric outlet in each stateroom located in the area of the desk. The outlet is equipped with a 3-prong 110 volt and a 220 volt (European). Carnival details the information on their website. Make sure you have the appropriate power strip otherwise it can get confiscated during embarkation and you won’t get it back until you debark your cruise. Two boarding gangways on Carnival Liberty. Carnival recently changed up their debarkation process. Now instead of getting a luggage tag delivered to your cabin, guests can pick which zone and what time they’d like to debark. If you’re carrying your own luggage off, this won’t apply to you because you can walk off whenever you’d like. However, if you have a late flight or don’t want to get off the ship super early, you can pick a later luggage tag. They go quickly, so if you have a certain time you’d like to get off the ship, get there early. The zone tags are typically located on deck five or by guest relations (I’ve seen them in both places on Liberty). Do you have any tips to offer anyone sailing on the Carnival Liberty?